I've made this curry recipe several times, but usually with chicken. It was just as delicious with shrimp and a nice change. I first found this recipe in the local newspaper and cut it out, and it's been my favorite curry recipe since then. Although there are a lot of ingredients in this recipe, there isn't a lot of chopping (just the onion and tomatoes, if you're using fresh tomatoes) and there's only one pan. Just make a trip to your local spice shop beforehand, and you're all set. So while the pot roast is cooking, start chopping up the vegetables for the curry. 1. Sauté cinnamon, cloves and cardamom in oil. 3. Add ginger and garlic. 4. Heat remaining aromatics (turmeric, paprika, cumin powder, and red chili powder). 8. Garnish with garam malsala and cilantro. Heat oil in a heavy saucepan. Add cinnamon, cloves and cardamom. Stir-fry for 30 seconds, and then add onion and sauté until golden brown about 10-15 minutes. Reduce heat and add ginger and garlic. Continue cooking 2 or 3 minutes, stirring constantly. Add turmeric, paprika, cumin powder, and red chili powder. Mix well. Add puréed tomatoes and stir. Cook until oil separates from the spice mix, about 5-10 minutes. Add 2 cups of water and scrape up any bits that have stuck to the pan. Bring to a boil. (If you prefer, you could purée the sauce, but leave some chunks for texture.) Add shrimp and cook until the shrimp is done, about 10 minutes. Remove cinnamon stick, whole cloves and cardamom before serving. Sprinkle with garam masala and garnish with chopped cilantro. Serve hot with rice or naan. Make the sauce but omit the shrimp. Recommended freezing time: 4-6 months. Thaw overnight in the refrigerator. Heat and serve with cooked shrimp. To save time, use bottled minced garlic and ginger. To save money, mince your own garlic and ginger. There's a complexity to this dish from all the spices. It gives the sauce a distinctive taste that is delicious with shrimp, chicken, or probably tofu. And I love the second day of the week too !! 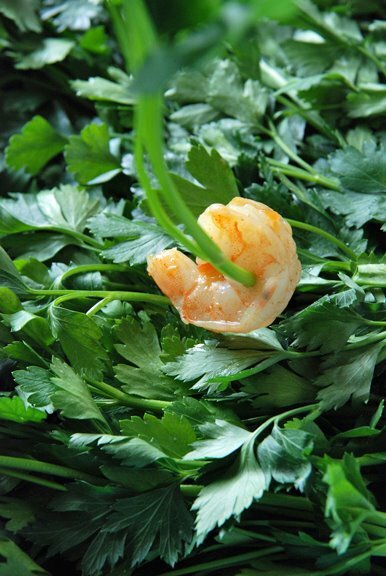 I love the look of that plump, succulent shrimp of a bed of cilantro leaves! Looks so delicious. The combination of spices is intriguing. Thanks. I'm lovin' this plan ahead idea!! Sounds wonderful! I love your photos, you are so creative with your presentations! Curry is one of my favorite blends of seasonings. I like heat! These sound wonderful and the simplicity of the recipe and preparation is very appealing. WOW 5 meals in 5 hours?! you're so busy! and they're fancy meals, too! 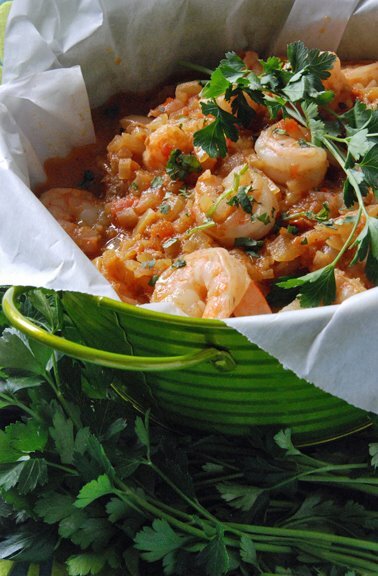 Mmm, this shrimp curry looks delish!! 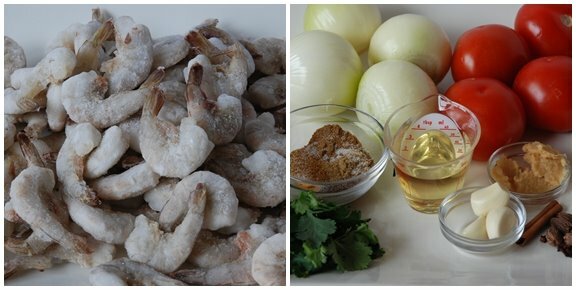 I love the idea of shrimp curry--so many fabulous flavors, such great protein, such great texture. It all sounds so perfect together. Can't wait to try this! Another great recipe for your week. Beautiful picture. AND, it looks delicious and tempting. I will make this dish for sure. It meets my criteria of good looking, delicious flavor, and not heavy. Can't wait to see the next three meals. I love this dish...all the health writers this year are touting tumeric and the rest of the ingredients in this sound just as healthy to me! Wonderful inspirational photos, as usual! I think this would be a winner at our house, will steal this one and give it a try soon. This shrimp dish looks really tasty! It's so pretty. Love all the green. Lovely for spring! This dish was tasty, but I found it needed a bit of a spice bump. I added 2 fiery Thai chilies. A good solid squeeze of fresh lime juice on top after wards added the final touch! Thanks for the link! I enjoy reading your blog and seeing your beautiful photos!